Below are a few common tasks within Global Properties. Under the Events column, double-click the event from which you want to remove a sound. The event sound is removed from the event. You can view which brokers are active in a specific market. You can configure how counterparty information displays in X_TRADER from the Counterparty Members dialog box within Properties to help you quickly identify certain brokers. Note: Customized changes are saved on your local workstation in the CounterpartyMembers.dat file located in the <root drive>:ttdatfilesTTCONFIG folder. Click the Counterparty Members button. The Counterparty Members dialog box appears. Click to select the counterparty member(s). Note: To select multiple members, press and hold the CTRL key and continue clicking rows. Enter an Alias that will display when the counterparty member is part of a trade. Click to select the Text Color checkbox or Background Color checkbox. Click the color bar. The color menu appears. Click an existing color from the color palette. -or- Click Other. The Color dialog box appears. Use the palette to select the custom color you want to use. To remove all local changes, click Remove All Local Changes. To remove local changes for individual Counterparty Members, click to select them. Click Remove Selected Local Changes. Enter the numeric counterparty member id (e.g., 123456) in the bottom-left text box and click Add ID. Use the Counterparty Members dialog box to configure how counterparty members display. The counterparty Name and ID are initially populated using information supplied by TT User Setup. You have the option to provide an Alias for the counterparty member as well as change the text and background color to help you identify counterparty members easier. If needed, you can also add a counterparty member ID prior to it being published by the TT User Setup Administrator. Assigned by the Exchange and provided by TT User Setup. This will display in the BidMbr and AskMbr fields if the Name is not provided. This will display in the BidMbr and AskMbr field if an Alias is not provided. Assigned locally and can have a maximum of 50 ASCII characters, including special characters. Can have a maximum of 50 ASCII characters, including special characters. If provided, the Alias will display in the BidMbr and AskMbr fields for the counterparty member. Sets the text color of the counterparty member in the BidMbr and AskMbr fields. Sets the background color of the counterparty member in the BidMbr and AskMbr fields. Removes local changes for the selected counterparty members. Removes local changes for all counterparty members. Adds a new ID to the Counterparty Member List prior to it being published by the TT User Setup Administrator. TradeSounds beep when trade updates come from an exchange. TradeSounds are simple two-toned beeps. The properties on the Sounds tab point to sound files housed on your local hard drive or network. 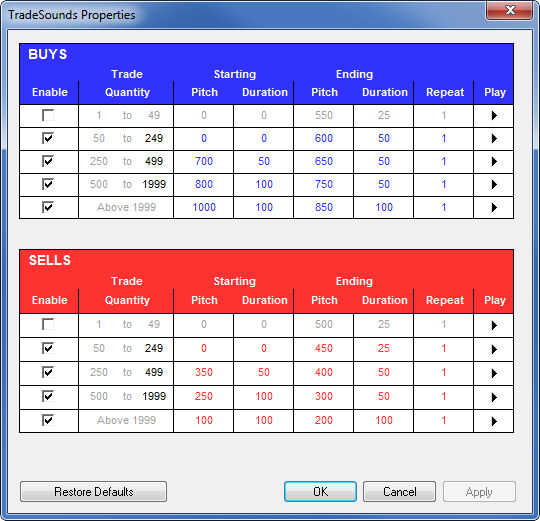 TradeSounds are completely configurable via the TradeSounds Properties button at the bottom of the MD Trading tab. Enable Plays a beep after a trade is made at the adjacent trade quantity level when TradeSounds are enabled. Enable TradeSounds via the MD Trader context menu. Sets the range a traded quantity must fall between to signal the TradeSound. You can customize up to five levels of sounds for both Buys and Sells. Note: The subsequent Trade Quantity changes based on the setting of the previous one. Sets the high or low tone and length of the first beep. To disable the first beep, make the Pitch and Duration zero (0). Note: If the Pitch for either the Starting or Ending column is 0, the Duration for that column must also be 0. Sets the high or low tone and length of the second beep. To disable the second beep, make the Pitch and Duration zero (0). Play Click to hear the two-tone beep as currently configured. Navigate to the MD Trading tab. At the bottom of the page, click the TradeSounds Properties button. The TradeSounds Properties dialog box appears. Under Trade Quantity column, set the range at which you want the first level TradeSound to alert you. Note: You can set up to five levels of TradeSounds for both Buys and Sells. Click the Play button to hear the default sound. If you want to change the quality or length of the two-tone beeps, change the Starting and Ending Pitch and Duration numbers as you desire. Note: To disable either the start or end beep, make the Pitch and Duration zero (0). Click the Play button to hear the beep as you change it. If you want the beep to play more than once, under the Repeat column, indicate how many times you want the beep to play when a trade occurs. Note: You can repeat a sound up to 5 times. Repeat Steps 3-7 for each of the five levels of Buys and five levels of Sells you want to set. When you are finished setting TradeSounds, click OK.
Right-click MD Trader to access the context menu. You can start and stop all installed X_TRADER and X_TRADER Pro plug-in applications from the Control Panel. Proper licensing must be in place in order to access each plug-in. Once started from X_TRADER, plug-ins perform normally. For instructions on using them, see the online help provided with each plug-in. When X_TRADER closes, all plug-ins started through X_TRADER also close. Note: When starting a plug-in the following indicates if you have proper licensing to the plug-in.